OneLoupe is a portable tool that allows you to view everything on the screen enlarged. Simple and easy to use, the small Magnifier is always ready when you need it to view all fine details, even the small print in the I-Net to decipher. OneLoupe is very practical and user-friendly. And it is virtually no burden on the system, an installation is not required. Once placed on the desktop, it is always ready for use. Adjustable zoom range, and the zoom factor allow an individual adapt to the needs of individuals. This will of course be saved for the next start of OneLoupe with your favourite settings. No installation is required to use this tool. 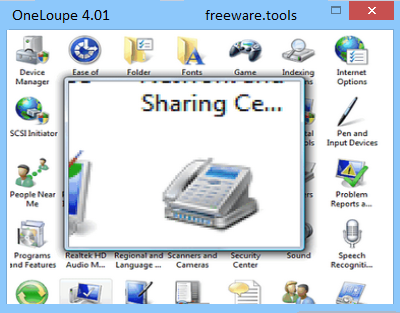 OneLoupe is a simple, yet handy application designed to provide you with a practical desktop magnification tool. A standard interface in not available, as the application only runs in the system tray, enabling you to access all its features and options from the right-click context menu. From here, you can set its behavior and configure the settings. The actual magnifier can be accessed either from the context menu, using a user-defined hot key or by simply double clicking on the system tray icon. It opens a box that displays anything on the screen enlarged, allowing you to analyze fine details. By using the arrow keys, you can adjust its dimensions, but full-screen mode is also available. OneLoupe features dual or multiple monitor support and adjustable zoom range. The zoom level can be changed using the keyboard (with the help of the 1-9 or the +/- keys) or the mouse wheel. Furthermore, it can grab the pixel colors from the desktop and copy the value onto the clipboard. Another interesting function is the possibility to place the magnified region as a bitmap image on the clipboard, so that you can paste it into any picture viewing application and save it to the computer. There are three available viewing modes: the normal mode allows you to move around with the magnifier to any desktop area, while the real-time and the working modes display the most recently selected region. One of the application's advantages is that it does not require installation or high system resources. In order to disable the magnifier, you have to use the Win+ESC key combination or access the context menu again. With its adjustable zooming options, OneLoupe can easily adapt to the particular needs of individuals, which makes it suitable for the visual impaired.